The folks behind fitness innovation, ClassPass, have come up with the latest way to get your food fix during weekday lunch hours. For less than $6 a day, MealPal is your gateway to a variety of options to satiate any foodie palate. Not only are we talking about MeltKraft to Ai Ramen and pretty much everything in between, it's at a price point that's likely less than what you'd be dropping for lunch anyway. How's it work? You log on to the site anytime after 5PM the day before until 9:30AM the day of your lunch and choose from the partnered restaurants. Select a 15-minute pickup window - that's actually quite flexible - and you're on your way to skipping the line, with no need to tip. Grab your lunch, get back to your office, and you're good to get your grub on! Regular readers know I'm a fan of Hai Street Kitchen's concept - fresh, fast, and light. 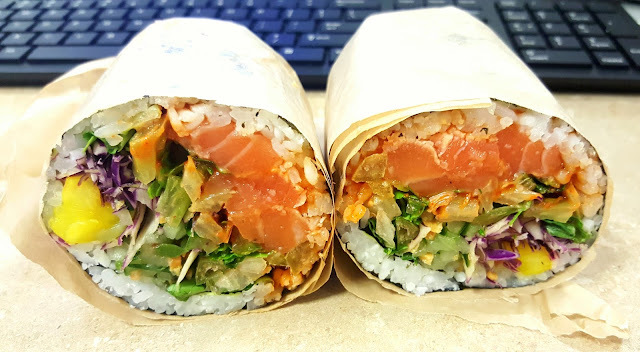 So for my first day, I opted for Hai Street's Spicy Tataki Salmon Sushirito, which was expectedly delicious. Fresh salmon, spicy gochujang, and crisp veggies made for a light way to begin the week, especially after coming off a particularly heavy Thanksgiving. When I saw pork belly on offer, I knew MealPal wasn't messing around. 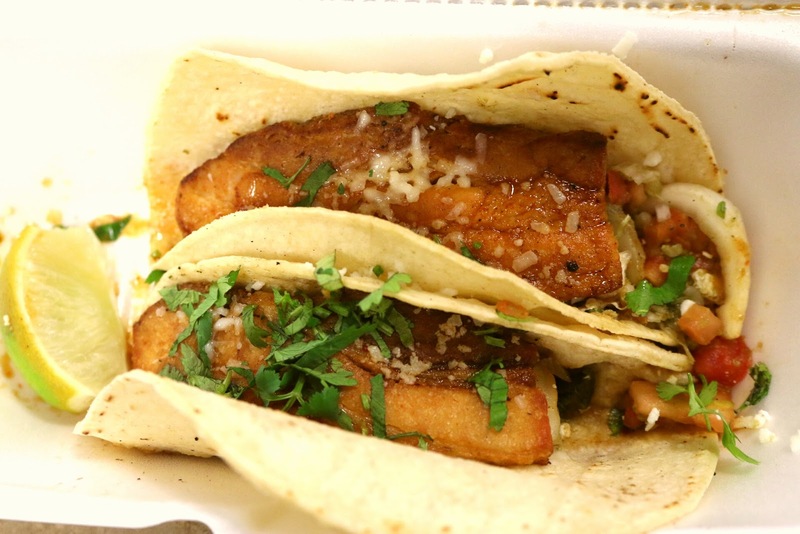 It didn't hurt that the chef behind Dos Tacos was none other than current Top Chef contestant, Sylva Senat! With a sweet soy glaze and pico de gallo, the thick-cut slabs of pork belly were nicely crisped and housed within corn tortillas. Two tacos might not seem like much, but when we're talking about the heft of pork belly, I finished these bad boys stuffed, but ready to get back to work. Anticipating a chilly Wednesday, I was looking forward to picking up some top notch ramen from Ai Ramen. 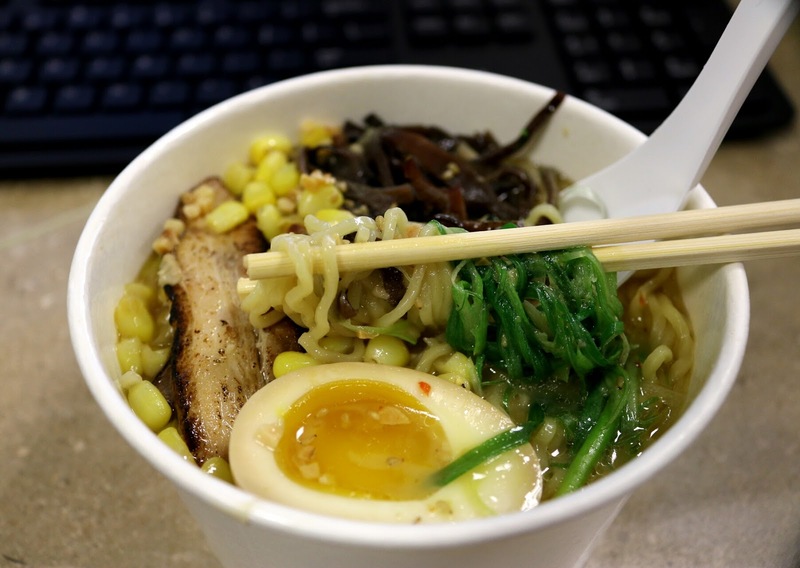 The fact that the ramen featured was the miso butter iteration didn't hurt matters! Tender slices of chasu pork belly and a soft-boiled egg paired beautifully with the sweetness of the corn and the miso butter broth. Definitely warmed me up! 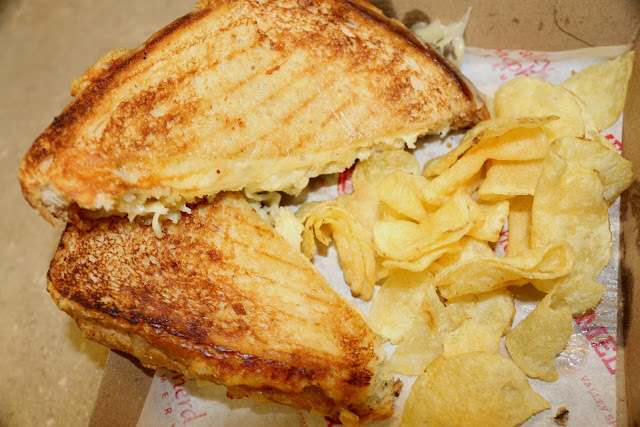 Day Four featured a decadent grilled cheese from MeltKraft. Buttery, rich, and gooey, I'm glad that I went to the gym before picking this bad boy up. Because there was no way I was going there after downing this! With kettle chips on the side, this was a filling Thursday lunch. For my final day, I opted for some lighter fare. 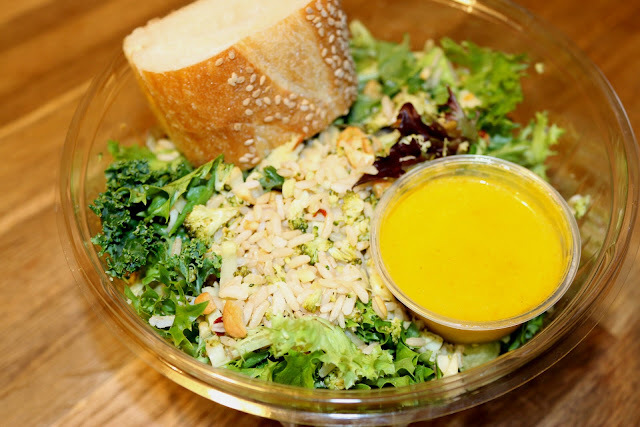 Kayu's custom salads and soups come from the folks behind Italian sandwich shop, Matt and Marie's. The broccoli nut salad was hearty, with fresh avocado, long grain brown rice, and a restrained spicy lemon chili broccoli mix with kale. Texture came the cashews and I enjoyed the carrot-mint flax seed dressing. Flavorful for being a vegan option! 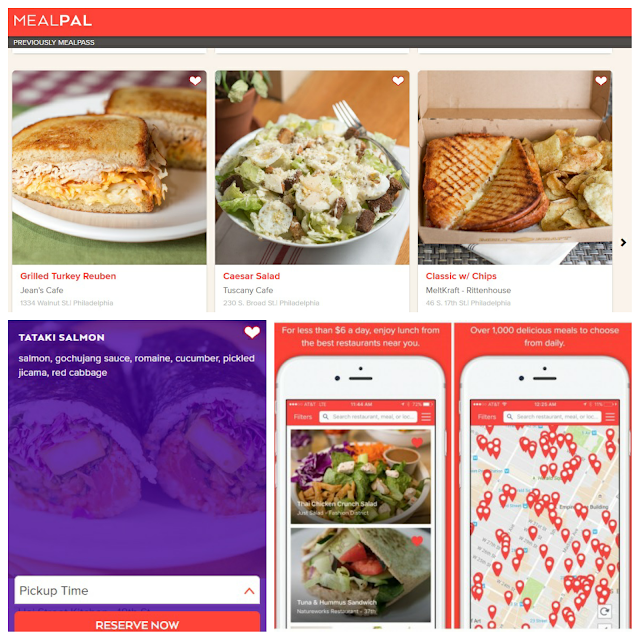 MealPal currently offers two monthly options. Twelve meals per month nets out at $6.39 a meal, while upping your lunch game to 20 meals brings it down to $5.99! I liken MealPal to your lunchtime negotiator, obtaining sizable discounts that save you a bundle. Keep in mind that as with any subscription-based service, it renews automatically unless you cancel. They allow you to filter for lighter options, which is helpful for those with dietary restrictions. And the daily reminder to choose your meal for the next day is helpful. For planners like me, it's the perfect way to schedule out my day. For those that prefer to make game-time decisions (aka slackers), maybe not so much! How can MealPal improve? For starters, I'd love to see the mobile app expanded to to Android users as it's annoying having to turn on your laptop at 5PM. Customization would be helpful whether it's added snacks or drinks at the point of choosing your meal. Even a comment section to add requests like "no mayo" or "less spicy" would expand the customer base. Delivery would be amazing, but understandably comes with its own issue and costs. Full disclosure, I typically don't eat out for lunch as I try to keep it light by bringing lunch from home. It's in an effort to counteract all the eating I do when I'm off the work clock! If that weren't the case, MealPal would be my way to go. It allows you to try places you normally might not go to for lunch, all while saving a buck or two! FTC Disclaimer: MealPal allowed me to try the Plan for a week to get the inside scoop. Regardless, my opinions are mine alone and, therefore, unbiased.